We were naturally delighted when Mark Whitworth told us he was going to see Ian Prowse perform Pele’s Fireworks album for it’s 25th anniversary and wanted to write about it for our Gig Night feature. If his last one for a Half Man Half Biscuit gig was anything to go by then we were in for a treat. Safe to say he didn’t let us down. In fact he’s gone beyond the call of duty here. It’s more than just a gig review. It’s a personal reflection of what was clearly a memorable night for him & if you don’t know much about Pele, don’t worry. Mark has added some bonus features for you. 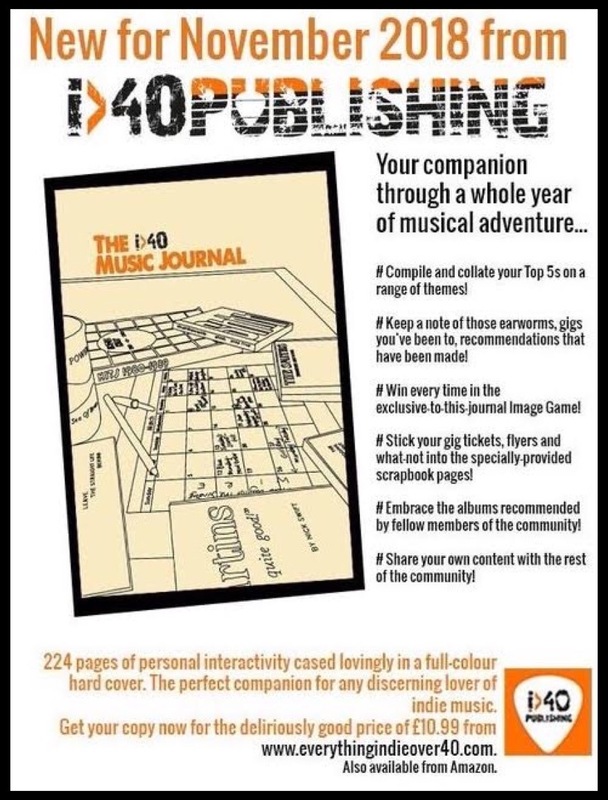 Despite making only the most negligible inroads into the lower reaches of the charts (ha! 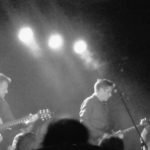 – as if the charts were ever a barometer of decent music anyway), Pele were an ebullient fixture on the live circuit in the early 1990s. If you were a student during this era the chances are they played at your university, probably several times. (I was at Bangor myself though – the “best” we ever got was D:Ream. Strangely enough I was washing my hair that night). 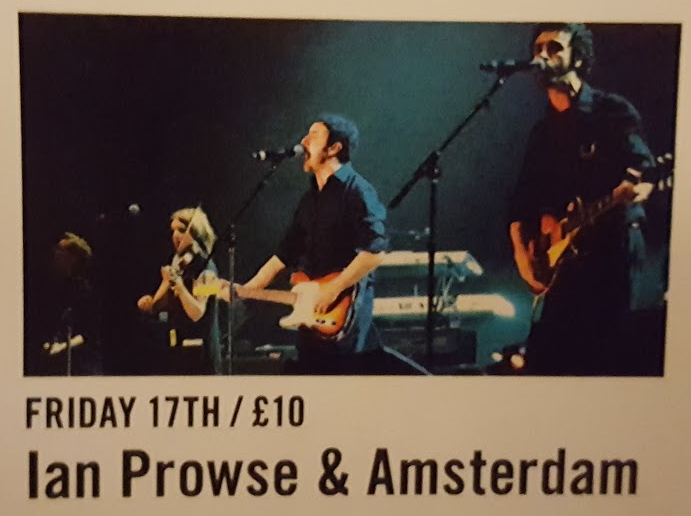 Even though I was living in Runcorn at this time, just a stone’s throw from Ian Prowse’s hometown of Ellesmere Port, I don’t think I actually remember hearing them on local radio. As I recall I first came across them via Channel 4’s Teletext pages (remember those? Seems practically sepia-tinged these days) and their review of the Fair Blows The Wind For France single (if you’re not too familiar with Pele’s output, the chances are this is probably the one song you may have heard of). The review sounded good so I sought out a copy, and it was indeed, and still is, a beauty. But don’t take my word for it – feel free to judge for yourself. The single was released in June 1992, and was taken from the album Fireworks which had come out in March of that year. It wasn’t long before I got hold of this too, and it was pretty much a permanent fixture in my cassette player that summer. Sadly, despite a devoted cult following, Pele were to last just one more album, 1993’s The Sport of Kings, before disbanding amid record company turmoil in 1994. 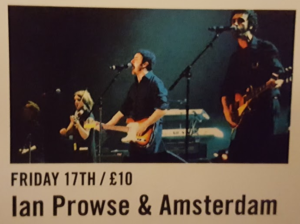 Fireworks, however, remains particularly fondly remembered among “Pele-people”, and thus the news announced last year than Ian Prowse and his current band, Amsterdam, were going to be touring Fireworks in full to commemorate the album’s 25th anniversary, was received with great excitement. And so it was that a couple of hundred folks “of a certain age” (along with a pleasing number of younger people it must be said) sauntered along to The Greystones in Sheffield to witness this celebration. 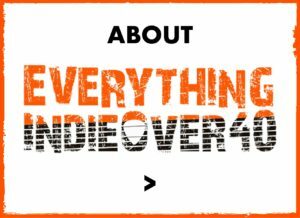 The Greystones is a smashing venue – a couple of miles out of the city centre, just past Hunters Bar (of Arctic Monkeys’ Fake Tales of San Francisco fame), it’s a cracking real ale pub with an intimate live music venue attached. I’d been once before, to see an unforgettable act by the name of Bob Log III (which is quite another story in itself), but was particularly looking forward to this one, seeing one of my favourite bands of yesteryear whilst simultaneously unencumbered by having to drive home. 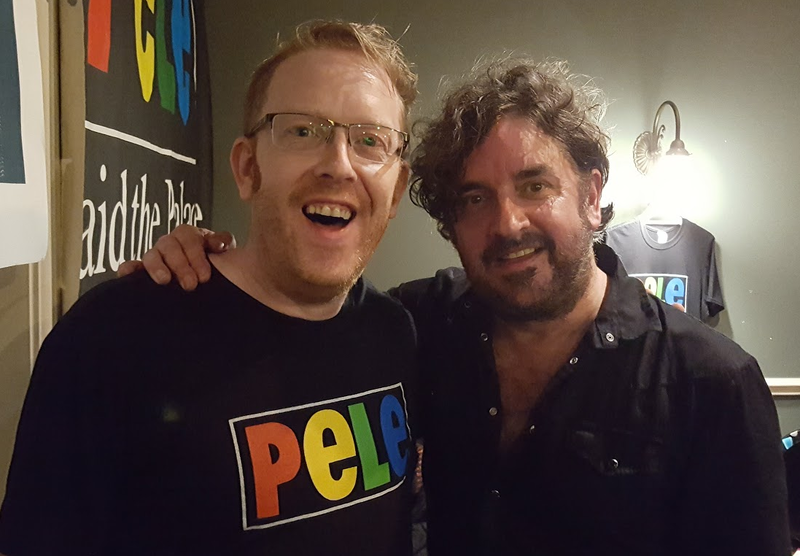 The first order of business though was to get hold of one of the seminal Pele logo t-shirts which had mercifully been reissued for this tour. The Pele t-shirt has a particular significance for me, as I was wearing my previous one (in the days when I could still fit in it) when I first met my wife in 1999. (Don’t worry, sick buckets are provided at the end of this review). There are a surprising number of original Pele t-shirts adorning members of the audience tonight (although perhaps only surprising to me, that anyone can still get into clothes they were wearing 25 years ago!) In any event it was a relief to be able to get my hands on a brand new one as I was concerned that the “sizes for the larger gentleman” may have sold out. Transaction duly completed, I caught the last couple of songs by the extremely agreeable local support band, Robberie (robberie.bandcamp.com). Their guitarist, Robin Byles, is a lifelong Pele fan, and was responsible for maintaining the band’s website and keeping fans up to date in the post-Pele years, for which Ian would thank him later during his own set. Before too long, Ian and the gang take to the stage themselves, and it’s straight into not the opener from Fireworks, but the penultimate track, Monkey Scream, with its haunting Hammond organ intro. By my reckoning it’s 24 years since I last saw Pele live, and it’s clear from the get-go that even though the songs are being played by different musicians, they have lost absolutely none of their verve and energy – Pele’s songs were always known for sounding even better live than on their records, and this remains the case all these years later. From here on they play the Fireworks album in full, in a different order to the familiar tracklisting. It’s absolutely brilliant to hear these songs again so many years after I thought I had heard them live for the last time. They are all nothing short of magnificent, and Ian’s tremendous voice is at its very finest the whole night; my own personal favourites are Searchlight, Megalomania, Oh Lord and the title track Fireworks itself. Before the final song from Fireworks, however, Ian announces that he is going to leave us waiting for that for a while, and tells us that he is going to play songs “that you won’t know if you fucked me off after Pele, even though we got even better!” To my considerable shame, I have to include myself in this category (don’t tell him!) – while I know the odd Amsterdam song, it’s really only the most passing of acquaintances. After tonight’s show I am determined to remedy this. 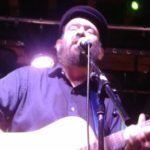 A handful of Amsterdam songs duly receive an airing, including the emotional My Name is Dessie Warren, a cover of a tribute to the titular trade union activisit, generally regarded as having been wrongfully jailed along with Ricky Tomlinson during the national builders’ strike in 1972. 10 years today since ‘Does This Train Stop On Merseyside’ was released. The evening is rounded off with a groovy version of The Word Is… , another track from The Sport of Kings, before coming to a close with, seeing as it is indeed March 17, Damien Dempsey’s St Patrick’s Brave Brigade, a tale of Irish expats who fought for the Mexican army against the US in the 1840s, and are revered today in both Mexico and Ireland as the Battalón de San Patricio. And with that, the night is complete. Well, almost; there’s just time to get my picture taken with the great man. There are some artists who you might feel uncomfortable approaching for a pic, but Ian couldn’t be more affable, and we chat briefly about the proximity of our home towns and what have you. 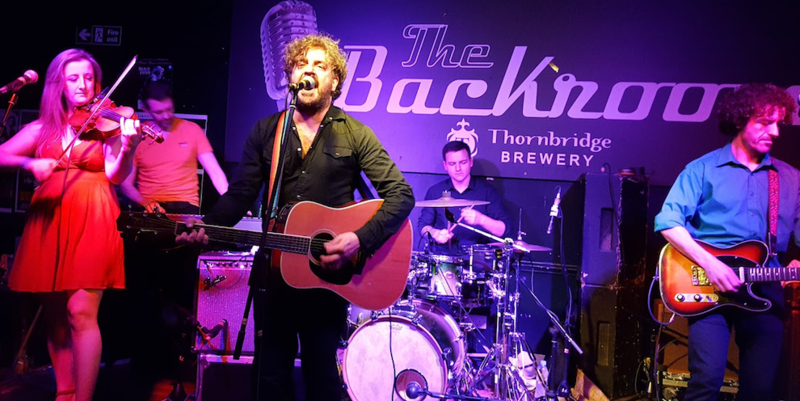 It’s been a truly rousing evening and a great reminder, as if it were ever needed, of just what a gifted songwriter and singer Ian Prowse is. I’ll definitely be familiarising myself with the rest of his back catalogue before too long. Until the next time, if you want me, I’m at the bar. P.S. Check out this brilliant documentary about Fireworks, made for the 25th anniversary. Mark Whitworth is originally from Runcorn in Cheshire but now lives in South Yorkshire. He is the bass player in rock & indie covers band Dr Hackenbush, is shortly hoping to start a PhD in Linguistics, and once sold a Big Mac to Mr T. He can be found on Twitter at @bringitonskippy, usually arguing about why the correct term for a soft white bread roll is “barmcake”.